When the others leave, following a hymn, we learn that Ismaele and Fenena are in love, having met in Babylon when he served there as ambassador. Even then they had a difficult time, because her jealous sister, Abigaille, loved Ismaele too. As they talk, Abigaille bursts in. She greets Ismaele with scorn, then privately tells him he can save his people and earn a new kingdom if he returns her love. Saying he cannot, he offers to forfeit his life for his people, while Fenena prays to the God of Israel to shield Ismaele. In the Hanging Gardens, executioners stand ready to do away with Zaccaria and his flock. The old man hails Fenena as a martyr, and she asks the Lord to receive her into heaven, but Nabucco arrives and orders the statue of Baal destroyed. Playing the part of Fenena in Nabucco by Verdi, my first more major comprimario role. 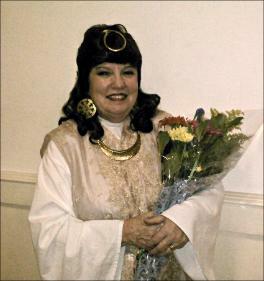 Playing the part of Anna in Nabucco by Verdi. 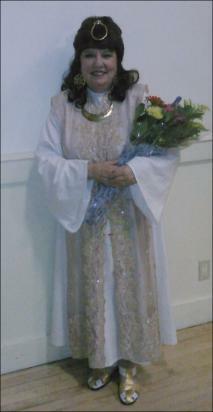 Playing the part of a Hebrew Virgin in Nabucco by Verdi.